In Stowaway: Curse of the Red Pearl, Kit Cabot is being groomed to take over his family’s shipping fortune in 1808 Boston, Massachusetts. While Kit yearns for the approval of his father, he finds the day-to-day operations of the family business incredibly boring. Determined to do something more with his life, and attracted to the seafaring life of his uncle, Kit decides to stowaway on his uncle’s ship. 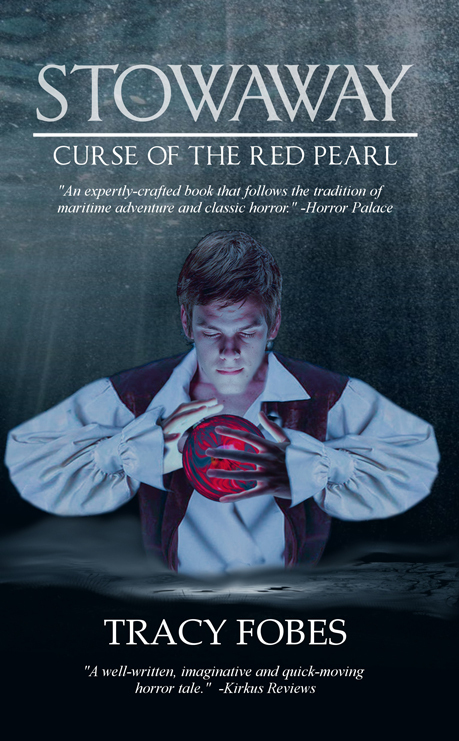 But instead of being swept up in the life of adventure and romance he always imagined, Kit finds himself subjected to harsh 1800’s maritime conditions and another stowaway with a sinister mission of its own. Stowaway: Curse of the Red Pearl combines high sea adventure with dark horror, and paints a world filled with both mundane and otherworldly dangers. It builds a claustrophobic sense of supernatural terror as Kit and his friends are forced to deal with the dangers of nature and an unknown horror possessing the ship. The story is imaginative, the writing is great, and the pacing is fast. It’s a delightful horror story that fans of historical fiction will definitely enjoy, since it combines history and horror. While I wouldn’t say I was terrified, it does have its moments.